Friendly staff from the receptionist to the shuttle service to the salesman. Steve Renaud was a perfect salesman. Well dressed, patient, polite, humorous & at no time did he put any pressure on my wife & I.
Joe Sassine is great to work with. . Very thorough and knowledgeable. Would strongly recommend him to anyone looking to purchase a vehicle. We purchased a Prius plug in hybrid and we are very happy with this car. Really like driving around Kelowna using the electric motor, hardly ever need to use the hybrid mode! The staff at the dealership including Joe and Dave were very patient and thorough. Setting an appointment time was helpful as Joe was available to help us in selecting a vehicle. Never any sales pressure, just thorough explanations of some vehicles available for us to consider. Also, we are really impressed with the Prius Plug in hybrid, I was not aware that they had a Prius that runs on both gas and electricity, Being able to charge the battery for running errands around Kelowna ( with about 30 to 40 kms per charge) , works amazingly well, as we live near downtown and have short drives. Awesome vehicle! Joe is great to work with. Joe is great to work with. 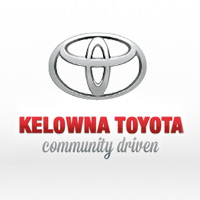 Very happy with recent purchase from Kelowna Toyota. Can’t wait to take delivery of my new Tacoma. Thanks again. I bought a new Toyota Rav4 Trail Edition after having a Honda Pilot for 14 years. I was looking for a smaller vehicle but didn't want to go to the Turbo Charged engines that all the smaller Hondas have now. I really like the 2.5L 4-cylinder and love the detailing of my new ride!